History lovers and nature enthusiasts alike flock to Fort Clinch State Park to experience this pristine attraction. The Civil War-era fort sits on 1,400 acres of beautiful, natural surroundings primed to explore. Read on to learn more about this Amelia Island state park and be sure to check out our Vacation Guide for more thoughtful suggestions to include in your itinerary! The Fort Clinch Museum is open 9 a.m. to 4:30 p.m. every day of the year and it costs $2.50 to enter the fort itself. Browse various artifacts ranging from a restored Gatling gun and carriage to a collection of photographs that highlight the fort’s construction history. The park contains 3.3 miles of paved road, a 6-mile off-road trail, and several miles of beach with hard-packed sand on which you can ride your bike! 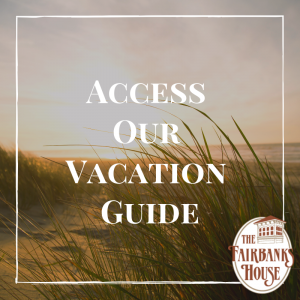 Tip: Fairbanks House allows guests complimentary access to Beach Cruiser bikes, beach chairs, umbrellas, towels, backpacks, and coolers! Did you know this park is one of the first stops on the Great Florida Birding and Wildlife Trail? Encounter a variety of bird species such as woodpeckers, red-tailed hawks, Barred Owls, Great Horned Owls, warblers, wrens, Gull-billed Terns, Wood Storks, and more! You can choose to hike the six-mile Willow Pond Hiking Trail that encircles a series of freshwater ponds. If you prefer, you can opt to stroll along the beaches of the Cumberland Sound where it’s possible to see the Cumberland Island National Seashore where wild horses roam! Fishermen and women will find plenty of popular fishing spots at the park! Surf fishing along the Atlantic shoreline and St. Mary’s Inlet allows for the potential to catch redfish, black drum, whiting, flounder, mullet, sea trout, and more. If you always wanted to hunt for treasure, the park is a great place to start! Try your hand at this new and exciting Geo-Seeking activity that allows you to track down trinkets, treasures, and more throughout the park! Be sure to check out this Geocaching website to get started! For those of you planning a romantic getaway, consider packing a picnic to take to the park! There’s nothing better than enjoying the warm, breezy weather in a sunny spot on the beach while savoring your lunch. Beachcombing is a popular pastime for seashell and sharks’ teeth collectors. Some of the best spots for finding shells include the areas north and south of the jetty rocks! Additionally, you can find sharks’ teeth along the shoreline near the fort. One of the best ways to experience the park is by surfing, swimming, canoeing, and kayaking! Just be aware that only the most experienced sea kayakers should venture out. St. Mary’s Inlet is known for powerful, unpredictable currents. Not only will you see a variety of birds at the park, but you can also spot dolphins, turtles, deer, alligators, raccoons, and more! Tip: The best times to see wildlife in the park is either early in the morning or just before sunset! Whatever it is that draws you to Fort Clinch State Park, you’re bound to have an amazing time at one of the best attractions in Fernandina Beach. During your visit on Amelia Island, do yourself a favor and stay at Fairbanks House, located in downtown Fernandina Beach! 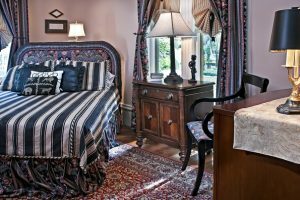 Surrounded by towering oaks, magnolias, and fragrant flowers, our B&B sets the scene for a dream vacation. Our beautiful accommodations, such as the Library room, make an excellent home away from home.